Using piles for the foundations of conservatory may seem excessive to some, but in an increasing number of cases it is the most efficient, economical and best solution. If the ground conditions dictate deep foundations and/or there is no access for a sufficiently sized excavator, then piles can be the best way forward. With trench foundations, the deeper we go the exponentially harder, more dangerous and expensive it becomes. The additional volume of concrete and soil disposal costs are fairly linear, but the digging gets progressively more time consuming and expensive as the depth increases. The trenches can and do collapse, fill with water or both. Additional shuttering is required to sure up the sides and ensure the safety of the operatives. Depending on access, this work can be time-consuming and messy. If the footings have to be dug deeper than expected due to unforeseen conditions or at the behest of a building inspector, all of the above problems are exacerbated. The main advantage of piling is that the certainty; with a trench foundation there is always the possibility that we have to go forever deeper incurring extra expense and time, with piles this is never the case. A typical piled system is completed in a matter of days, a deep trench dig can take far longer if access for machinery is poor. We conduct an initial site survey, assess the species of any trees and measure their distance from the new structure. Ground levels, drainage runs and nearby buildings are also noted. We then consult the Local Authorityʼs Building Control Department and the British Geological Survey on the type of ground we are likely to encounter in that area. 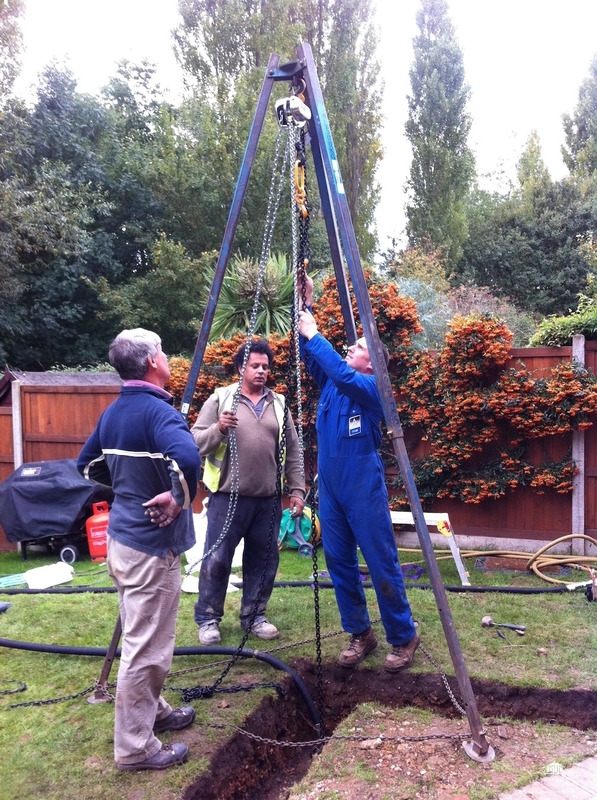 A trial hole may be dug and a decision to use either strip foundations or piles made. Where piles are to be used, our structural engineer will design the foundations with either a piled raft or piled groundbeam. The pile spacings, groundbeam/raft spans and specification are designed in accordance with the loads imposed by that specific structure. For the single storey conservatories and extensions that we build these loads are relatively light. Each pile will provide a Safe Working Load of 100kN with a safety factor of 2, or 67kN with a safety factor of 3. The piles will be driven until they meet the required resistance, or “set”. This effectively tests each pile as it is placed, so a lower safety factor is often justified. However the limitation of the span between piles of groundbeam or raft will mean that a greater number of piles are often called for. This means in practice that each pile will often only be required to bear a load of 50kN or less. ￼The first step is to excavate for the groundbeam or raft. This is normally done manually as the decision to use piles is often influenced by the impracticality of using a mechanical excavator. The position of any drainage is verified, this is exposed or altered if required. Should this conflict with the designed pile locations, it is referred back to the structural engineer who will modify the design accordingly. The pile placements are marked and the piling can begin. The piles are made from steel tube with an external diameter of 150mm, we generally use sections 2 metres in length. The first section, or starter pile, has a closed end, this has been crimped and welded to a point. Some ballast and dry cement are poured into the end of the pile to a fill depth of 500mm, this forms a plug into which the piling hammer will drive. All personal will be wearing Personal Protective Equipment and will have passed the Certificated Training Course on the Correct and Safe Operation on the Piling Equipment. The piling hammer is powered by air from a compressor, this is usually a road-towable type and is left at the front of the property. The two hoses which run from it can pass through an existing building if no other access is available, to the area where the piling is to take place. One hose connects to a lubricating unit which adds a small amount of oil to the air, then both hoses merge through a Y-branch and connect to the piling hammer by means of a reinforced hose. We use a Grundomat 130P pilling hammer, this weighs 117kg and will be lifted by mechanical hoist into the starter pile. A typical hoist arrangement is a 3 metre high tripod (shearlegs), a lifting chain and a chainblock pulley, all of which are rated to lift at least 500kg. The lifting chain is secured to the back of the piling hammer, this remains attached through the procedure. One advantage of this bottom-driven piling system is the low impact on the local environment, both in terms of sound and vibration. The loudest sound is usually the compressor, which is similar to the diesel engine of a motor vehicle. The energy is focused directly on the bottom of the pile in the ground below, which means surface vibrations are minimal and reduce as the pile goes deeper. Once the Grundomat is lowered into the pile, it will rest on the ballast and cement plug. The power is gradually applied and the Grundomat will crush and compact the plug so it forms around the head of the Grundomat providing a tight connection between the pile and the hammer. This is allows the force to be distributed evenly to the pile and reduces the possibility of the hammer driving out through the bottom of the pile. As the hammer sets into the plug, the sound will change and the pile will start driving downwards and the power can be increased to full. It is important at this stage to ensure the pile is perfectly vertical by use of a spirit level. The first two metre pile will continue downwards through the loose soil near the surface until the back end is only half a metre is above ground, then the power is cut. It is now necessary to to weld a second section, or “follower” onto the rear of the starter. It is not desirable to remove the piling hammer, it will spoil the plug and is a waste of time, so the hammer is left in the bottom of the first pile with the air hose and lifting chain connected the the back of it. We have to disconnect the air hose from the Y-branch, thread a new piling tube section onto both the hose and the lifting chain, then attach the second tube to the first. ￼The rear of each section of piling tube is splayed slightly to form a socket into which the follower is inserted, these are then arc-welded together. Once the new follower is attached, the power is reapplied and the pile continues downwards. The rate at which the pile descends normally decreases as it meets firmer, more compacted ground. Further followers are attached in the method described above until the required set rate is reached. In clay soils the piles typically reach the required set at a depth of around 6 metres. The requirement for this is for the pile to penetrate a depth of 10mm or less over a period of 10 seconds. This should be checked over a penetration of 100mm. Once this set is achieved the hammer can be extracted. A log is kept of the set times and depths of each pile. The hammer is put in reverse by a quarter turn of the air hose, this allows it to free itself from the plug. It is then hoisted out by the chainblock and placed ready for the next pile. The end of the pile is unlikely to be protruding the required distance from the ground to make the connection to the steel reinforcing, so may need to be cut down. Depending on ground conditions a void former may be required beneath the groundbeam or raft to allow for clay heave. Steel reinforcing bar is placed into the centre of the pile, this is then connected to the steel mesh used to form the groundbeam or raft. The steel reinforcing is pre-cut and bent to our specification, then joined on site either by tying or welding. Once in place the piles and steelwork is ready for inspection by building control. The depth of the piles can be verified by tape measure. Having been approved, the piles and groundbeam/raft are ready to be concreted in one process. C35 concrete is normally specified, it is important this is consistently compacted to the bottom of the pile. Other than the initial excavation, the entire process will take around four days for a typical domestic extension or conservatory. The end result is a groundbeam or slab ready to accept masonry and capable of withstanding loads well in excess of those that it is likely to receive. Even though the bearing capabilities of the piles are often superfluous in the context in which they are used, the speed, safety, tidiness and certainty of this method mean it is the most practical and economical choice in many situations. This method is also more environmentally friendly than trench-fill foundations both on a local level in terms of noise and disruption, and a global one due to a lower level of carbon emissions as a result of less concrete being used.